The top of my cat’s head makes a nice cameo in this one question interview on Hypertext. They also put up an excerpt of T&TOSM here. Do you ever get bored with writing stories that take place within the boroughs of NYC? Absolutely. Bored to tears and uninspired. My first novel, Condominium, took place exclusively within the glass and steel confines of BK and that graveyard they call Manhattan. Fortunately, there’s a lot of rich material to be mined from this city, a lot of weird little hidden realms and micro-cultures to exploit for plot support, color, and laughs. So it didn’t really bother me when writing that novel. If anything, all the subway hassles, street scenes, junkie interactions, trust fund Williamsburg chatter, and nightmare neighbors through thin walls added an element of claustrophobia and fear to the novel which ended up being the key ingredient that tied it all together. I’m not saying the novel was entirely successfully executed, but if it held together in any way then the glue was definitely the NYC strain of neuroticism, which is deeper and stranger than any neuroses you will find anywhere on the planet. With the new novel, Travels & Travails of Small Minds, that claustrophobia and neurosis started to come around on ME instead of just the characters. I mean, how many ways are there to describe the smell the Chinatown fish vendor stands in August? How many times can one be forced to Google such lame little details as “Is there a cool bar called North Korea off the Halsey L stop in Bushwick” (OF COURSE there is) without disintegrating into a depressed and irritated puddle as grey and self-obsessed as the city itself? The book started off within this NYC holding cell, and by page ten I was already plotting the lead character’s escape. So where did the lead narrator escape to? The cool thing about fiction, I tell these Brits, is that one can weave whatever world they wish. I’ve received far less heat from the denizens of the other location the lead character escapes to, Russia, which is strange since I’ve never actually been the country at all, ever. This is most likely because I know very few fine Russian folk, and the ones I do know wouldn’t bother to read the drivel I produce. Oddly, the Russian passages in the novel are some of the only writing I’ve ever produced that didn’t cause me to cringe while re-reading it. This is why I’ve chosen a piece from the Russian section for my excerpt here. If you want to read about Wolfton, you’ll have to check out the book. You don’t really have to know about the plot or the character or anything else when reading this, because it is actually the very first pages of the novel even though it was one of the last pieces of content produced. Hopefully you’ll be able to feel the sheer escapist glee that bleeds through, the joy of taking a character away from the NYC discomfort zone and into alien lands free of bodegas and L Trains and heart attack bagels. An escape from new York, Kurt Russell style. 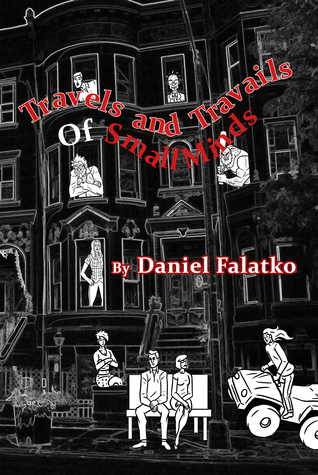 Find out more about Travels and Travails of Small Minds and Daniel Falatko HERE. TTOSM has officially been unleashed. Shout out to Ardent Press for publishing this madness.